Imagine a sunny terrace in the morning, you're sipping a caffe latte, perhaps you're reading the paper or admiring the streetscape that has hardly changed in 100 years. Well that's what you'll get when you stay at the Magnolia Court Hotel Melbourne Esat. 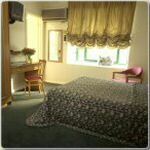 The Magnolia Court Hotel is an independent family-run accommodation establishment. The small but dedicated hospitality team, operate this comfortable and quiet East Melbourne hotel accommodation. Accommodation at the Magnolia Court Hotel offers elegance and charm tucked away in trendy East Melbourne. Our boutique hotel is set amidst prestigious and leafy historic houses, a few minutes walk from the MCG, Melbourne Park Tennis Centre and Fitzroy Gardens. The grand old streets of East Melbourne provide a reflection from the days of the lucky strikes in the Goldfields. The transition from residential quiet to downtown excitement is virtually seamless when you stay at the Magnolia Court Boutique Hotel Melbourne. The Boutique Double Hotel Room at Magnolia Court Hotel Melbourne provides the perfect hotel accommodation right on the outskirts of Melbourne's CBD. These old-fashioned, elegant hotel rooms feature a Queen bed, ensuite bathroom, colour TV, reverse-cycle air conditioning, refrigerator, hairdryer, in-room safe, tea/coffee facilities, direct dial telephones and modem/data points. Quality hotel accommodation in Melbourne. The Boutique Twin Hotel Room at Magnolia Court Hotel Melbourne offers travellers the ideal hotel accommodation in a great Melbourne location. These old-fashioned, elegant hotel rooms feature a 2 Single beds, an ensuite bathroom, colour TV, reverse-cycle air conditioning, in-room safe, refrigerator, tea/coffee facilities, hairdryer, direct dial telephones and modem/data points. 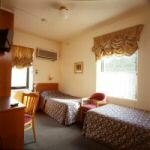 Value for money East Melbourne hotel accommodation.